Navan Fort (Emain Macha is Old Irish, Eamhain Mhacha in modern Irish) is located in the townland of Navan, outside Armagh City. The site is part of an important archaeological landscape that includes Haughey’s Fort, The King’s Stables and Loughnashade. 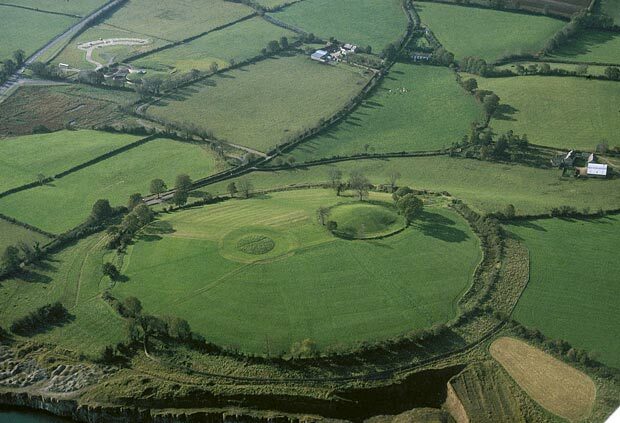 Navan Fort is located on a low hill and consists of a circular enclosure 250 metres in diameter, surrounded by a bank and ditch. Inside the enclosure two monuments are visible. Off-centre to the northwest is an earthen mound 40 metres in diameter and 6 metres high. Also slightly off-centre to the southeast is the circular impression of a ring-barrow, about 30 metres in diameter. Archaeological excavations have revealed occupation layers that date back as far as the Neolithic period. Navan Fort continued to be used into the Late Bronze Age and Iron Age when a number of figure of eight structures were built. The 40 metre mound was created in in the Iron Age, in 95 BC. A circular building consisting of four concentric rings of posts around a central oak trunk was erected on the site. The structure was then deliberately burnt down filled with stones and covered in a mound of earth and turf. This process is considered to be part of some important Pagan ritual and the site continued to be considered sacred into the early Christian period. It is towards the end of this period that monks began to transcribe the tradition of Emain Macha. According to Irish mythology and historical tradition it was the capital of the Ulaid, the people who gave their name to the province of Ulster. Legend relates that it was founded by the goddess Macha in the 7th or 5th century BC, and was the seat of Conchobar Mac Neasa in the tales of the Ulster Cycle. Take a look at the website Navanfortapp.com or the blog feed below to find out more. The post Cú Chulainn’s Challenge App Video appeared first on Navan Fort Heritage Apps. The post Download Discover Navan Fort Heritage App appeared first on Navan Fort Heritage Apps. The post Cú Chulainn’s Challenge in the App Store appeared first on Navan Fort Heritage Apps.